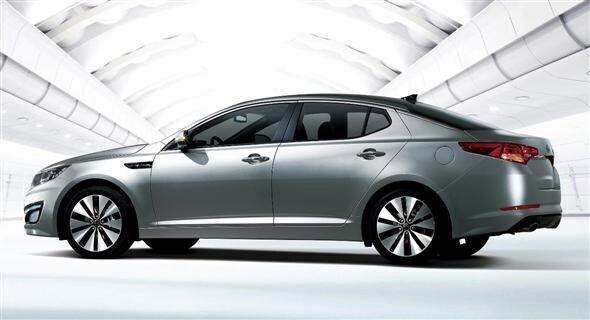 Kia has revealed its new Optima family saloon set to rival the Ford Mondeo next year. Despite the new name the Optima is a replacement for the Magentis. Gone are the tired looks of the Magentis and instead it gets a sleeker grille design and raked roofline for an up-to-date, aggressive look. Drag has also been reduced over the previous model so the newer car is claimed to be more refined, faster and economical. The update has also made its way in to the interior of the car with better quality materials and a more premium feel, while a special 'sport package' is available that offers a bodykit, LED running lights and rear lamps, high performance dampers, larger disc brakes and 18-inch alloy wheels. The car will come with a choice of two engines. The first is a high-efficiency 1.7-litre diesel engine with 134bhp and promising best-in-class emissions of 113g/km when fitted with stop/start - meaning the Optima could cost as little as £30 a year to tax. The other choice is a 2.0-litre petrol engine gets 168bhp. A six-speed manual, or automatic gearbox can be chosen. Available as standard, or as options, on higher models are features such as automatic folding mirrors and smart parking assist, which automatically parks the car. 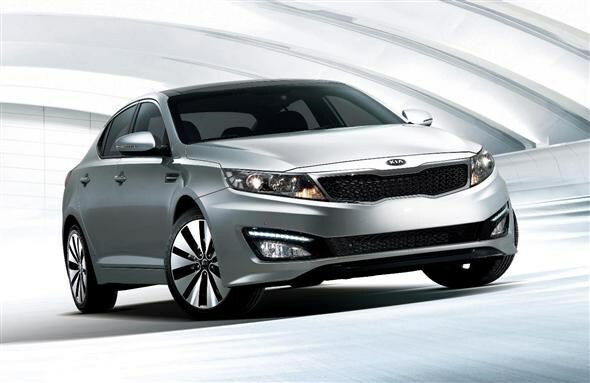 The Optima will go on sale in the UK next summer with prices expected to start at around £18,500.